Awana is a nondenominational ministry that assists churches in reaching children and teenagers with the gospel of Jesus Christ and training them to serve Him. Here at New Baptist Church, our Awana ministry works with other ministries to give our children and youth a well-balanced emphasis on knowing Jesus and how we can live for Him and serve Him. 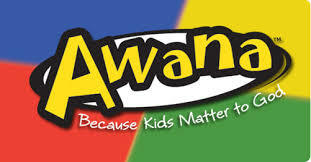 Awana meets Sunday evenings (6:00pm - 7:30pm) September through May. Do your best to present yourself to God as one approved, a workman who does no need to be ashamed and who correctly handles the Word of truth. Game Time - Individual and team competition takes place through circle games exclusive to Awana. Every child gets involved and has a chance to unleash his or her energy. Handbook Time - Children work one-on-one with a trained leader to complete assignments in the curriculum materials. Awana emphasizes memorization and understanding of key Bible verses that show how to know God and walk with Him. A series of awards and trophies reward achievements at every level as children progress. Council Time - Everyone gathers together for announcements and award distribution.